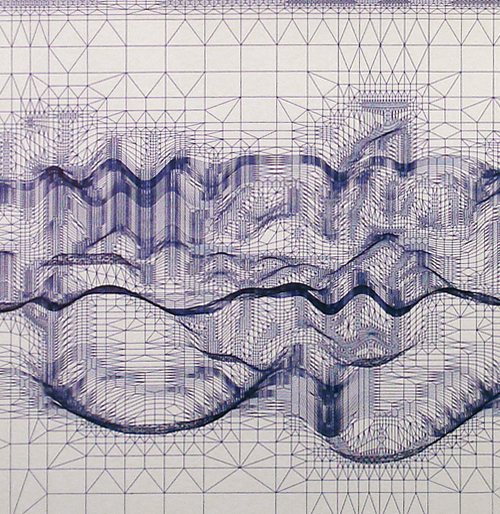 "My drawings begin by asking indirect questions which yield no concrete answers. As with my three dimensional work, my focus is on the process rather than final product. I am fascinated with computer technology and its ability to mistranslate information. Like a game of “telephone”, multiple software programs fracture and compound text and image as they travel through different formats on the computer. Bearing little resemblance to their origin, the new information is rendered on a pen plotter creating a chaotic world rooted in happenstance. No longer legible, I see the drawings as blueprints for invisible cities, answers to questions that may unfold over time."